Band of Brothers by Stephen E. Ambrose. I adored the TV series. Lately, I've been fascinated by WWII history, and some of this history is working its way into my next book. I'm ashamed to admit that I have a black thumb! However, my husband and I have a beautiful flower garden outside our front door, which our thoughtful green-thumbed neighbours tend on our behalf. So we're able to enjoy many gorgeous flowers. I'm also ashamed to say I don't even know what they're all called, but there are some beautiful pink and purple hydrangeas that I love. "Game of Thrones." I haven't started reading the books yet, but they're definitely next on my TBR pile. The thought of something happening to Dexter, our pug. He's now a grown-up dog at 2 years old, and is having all sorts of new adventures. 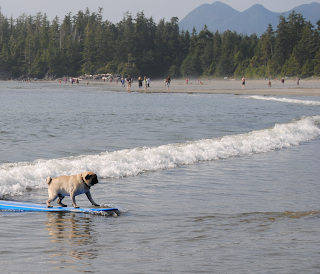 Here he is, learning to surf this summer. Ex-cop Brandon Clarkson is an angel with an edge. His tough exterior is the perfect camouflage for his job—hunting down the most dangerous criminals on earth. A self-reliant and demanding lone wolf, Brandon is the perfect angel to track and capture demoness Luciana Rossetti.Beneath the surface of Luciana's cool, green-eyed beauty lurks the heart of a malevolent killer. 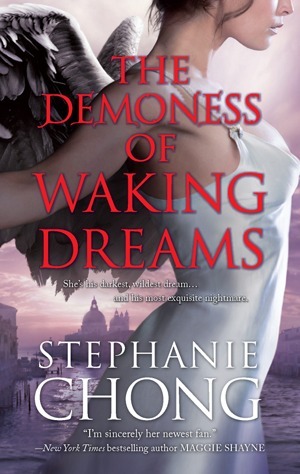 In the winding streets of Venice, she lures Brandon into her dark world of pleasure. Stephanie worked as a lawyer at a top-tier Canadian firm and completed five university degrees before landing her dream job: romance novelist. Her degrees include a J.D. and a Ph.D. from the University of Toronto, and a Master’s in Creative Writing from Oxford University. When she’s not writing, Stephanie enjoys yoga, traveling and outdoor adventures. She lives in Vancouver with her husband and their pug, Dexter. You can find Stephanie online at various places! Dexter surfing is fabulous! I look forward to her book.